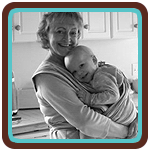 Breastfeeding is the optimal way to satisfy an infant's nutritional and emotional needs. "Bottle Nursing" adapts breastfeeding behaviors to bottle-feeding to help initiate a secure attachment. Follow the feeding cues for both infants and children, encouraging them to eat when they are hungry and stop when they are full. Offer healthy food choices and model healthy eating behavior. Touch meets a baby's needs for physical contact, affection, security, stimulation, and movement. Skin-to-skin contact is especially effective, such as during breastfeeding, bathing, or massage. Carrying or babywearing also meets this need while on the go. Hugs, snuggling, back rubs, massage, and physical play help meet this need in older children. Positive discipline helps a child develop a conscience guided by his own internal discipline and compassion for others. Discipline that is empathetic, loving, and respectful strengthens the connection between parent and child. Rather than reacting to behavior, discover the needs leading to the behavior. Communicate and craft solutions together while keeping everyone's dignity intact. It is easier to be emotionally responsive when you feel in balance. Create a support network, set realistic goals, put people before things, and don't be afraid to say "no". Recognize individual needs within the family and meet them to the greatest extent possible without compromising your physical and emotional health. Be creative, have fun with parenting, and take time to care for yourself.